100 Pcs 5.51" x 7.09" (14x18cm). It made of eco-friendly and biodegradable non-woven fabric material. Because of excellent water absorption and permeability,the plants grow well and promote high seedling survival rate. You don't need to remove the bags when transplanting. Save much more time and cost less. Widely used in agriculture, forestry, fruits and vegetables. Perfect for gardeners! Material: Biodegradable and Eco-friendly Non-woven fabric material. Don't need to remove the bag when transplanting, high work efficiency and reduce recycling cost. Excellent water absorption and permeability, nutrient and moisture can be absorbed easily. 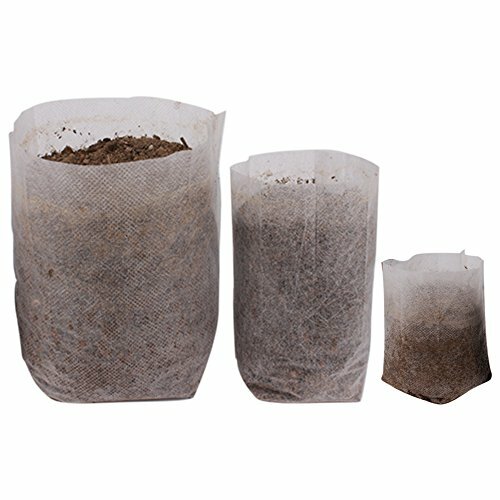 High seedling survival rate, fast growth, ensure the plant grow well. Prevent the seedling from forming entangling roots and decaying roots. Application: Widely used in agriculture, forestry, fruits and vegetables.